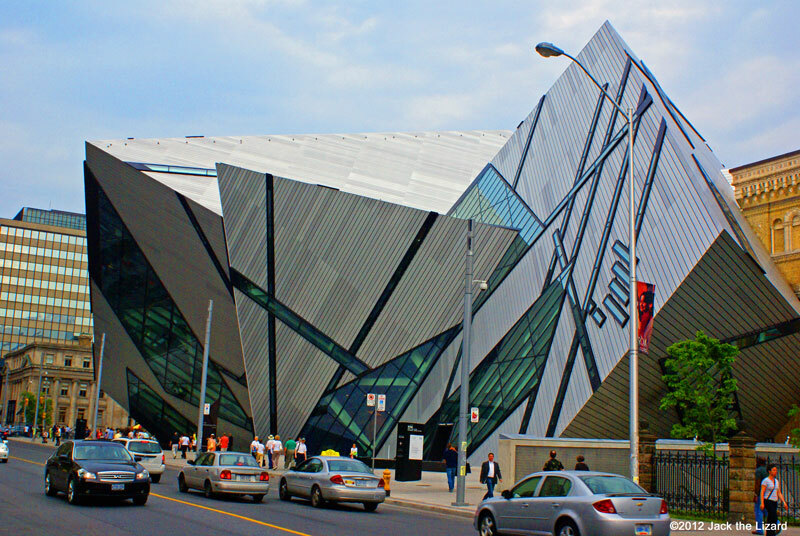 Royal Ontario Museum (ROM) is located at the city of Toronto, Canada. Since the Duke of Connaught and the Governor-General of Canada opened ROM to the public in 1914, the galleries have had varieties of exhibition on archaeology, geology, mineralogy, paleontology, and zoology. ROM have been renovated and expanded several times since then. One of the major changes is the construction of contemporary building “Michael Lee-Chin Crystal” in 2007. It is the iconic attraction of Toronto now. ROM attracts not only Torontonian but also tourists from all over the world. ROM opens every day except Christmas Day (December 25). 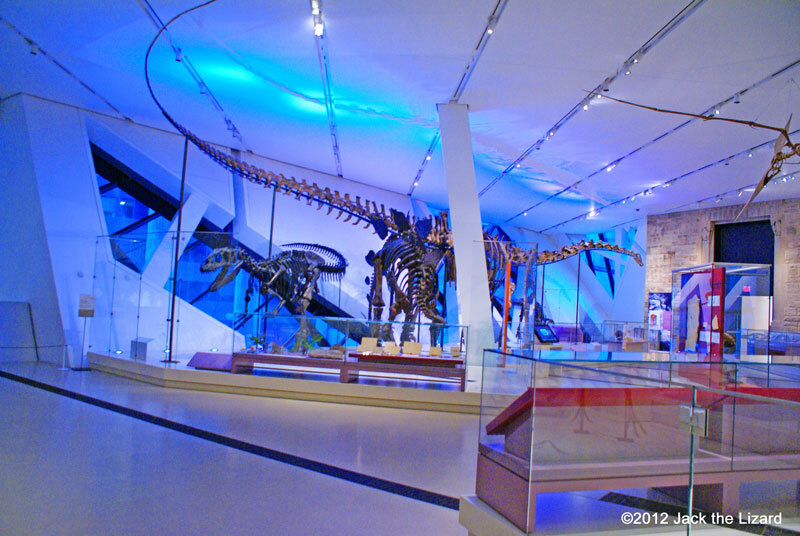 The galleries are organized in two main themes, World Cultures and Natural History. In the galleries of the world cultures, you can see the collections of which date back to from 2,000 BC to 18th century sculptures, paintings, potteries from the several continents. In the natural history galleries, the nature of Ontario and the world is on viewing and importance of biodiversity is narrated in the course of displays. 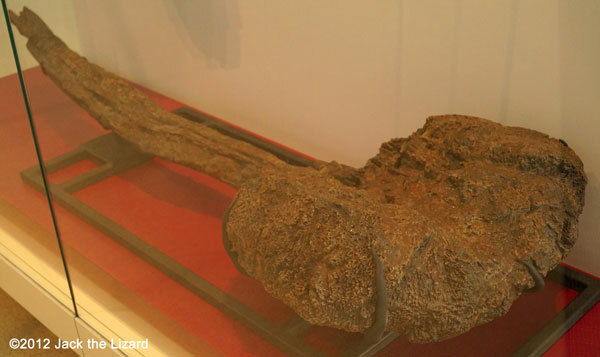 Visitors also have some opportunities to touch the exhibition items such as furs and bones. This time Jack the Lizard is taking you to the galleries of prehistoric animals. The galleries are sorted into groups of the Triassic, Jurassic, Cretaceous, Tertiary and the Quaternary Period. Dinosaurs and the other animals were grouped into terrestrial and aquatic habitats in each period. Eurypterids are sea scorpions and this particular giant sea scorpion is called Acutiramus that lived in the sea about 420 million years old. 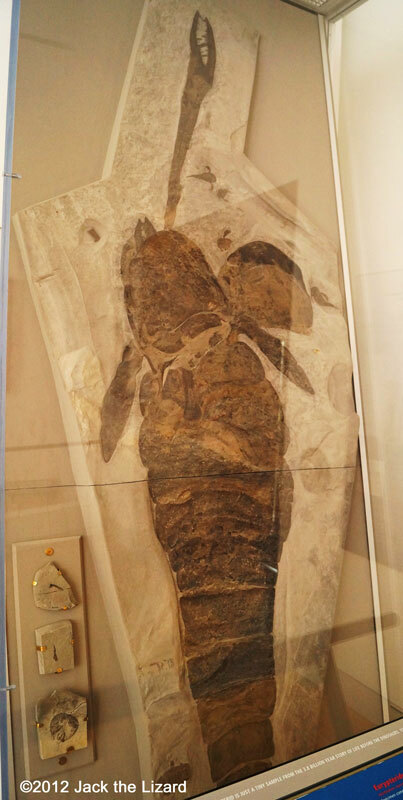 This fossil was found in Ilion in New York, one of the biggest fossils of sea scorpions. The tail section was discovered and dug out in 1982. The head and body sections were found later, and in 1997 the claw. 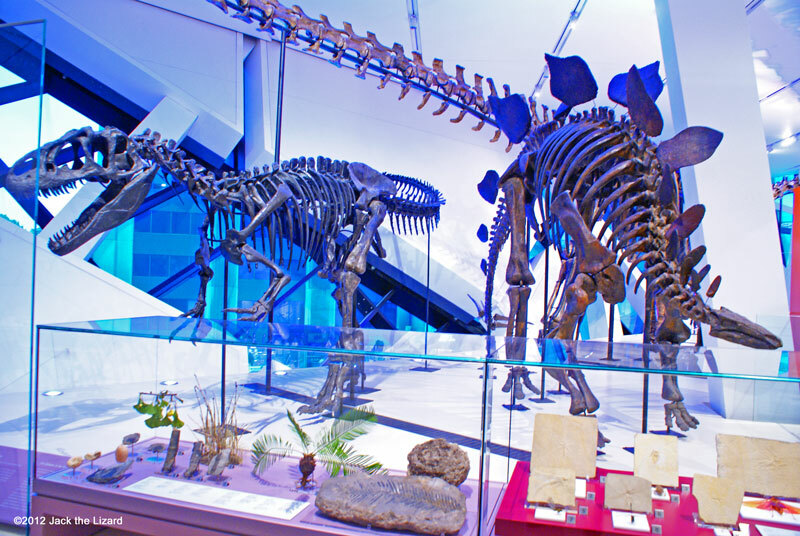 The fossils came to ROM in 2002 and 90% of the specimen is complete now. Acutiramus was the top of food chain in the Silurian Ocean. Many of the sea scorpion fossils have been found in New York and Ontario, but most are rather small. Small sea scorpions are called Eurypterus. This Barosaurus, nicknamed as Gordo, is 27 metres (90 feet) in length. If he was still alive he would be weigh 15 tonnes. 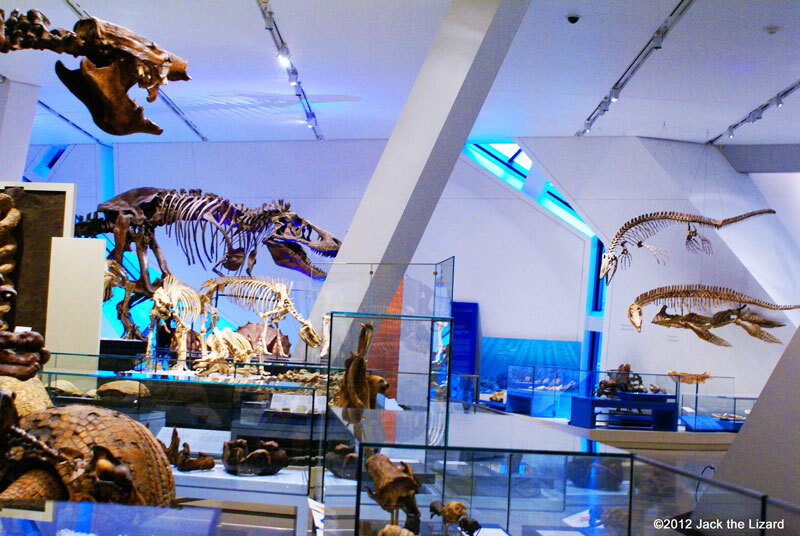 Gordo is only the Barosaurus on display, which is made of mainly the real fossil bone mounted in a life posed in the world, and the largest dinosaur skeleton on display in Canada. The collection of the bones of Gordo the Barosaurus were studied and kept separately on different shelves and in different drawers due to a lack of space for this huge dinosaur. The new gallery space allowed him to be in this life posed finally in 2007. 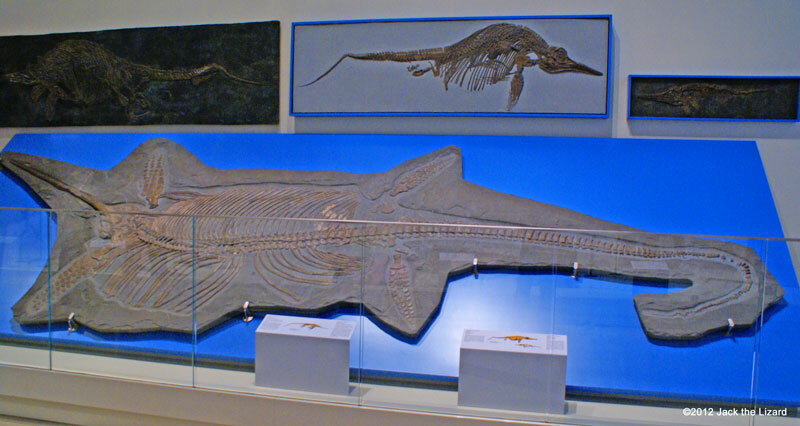 Eurhinosaurus is the one of the ichthyosaurus family. 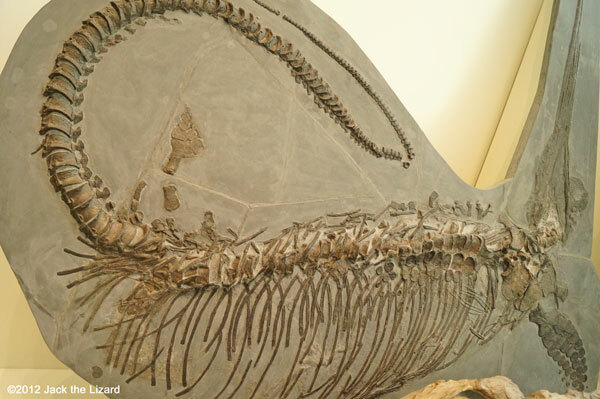 Eurhinosaurus Iongirostris means “long-snouted good-nosed lizard.” The 180 million years old Ichthyosaur fossil was found in Holzmaden, Germany. 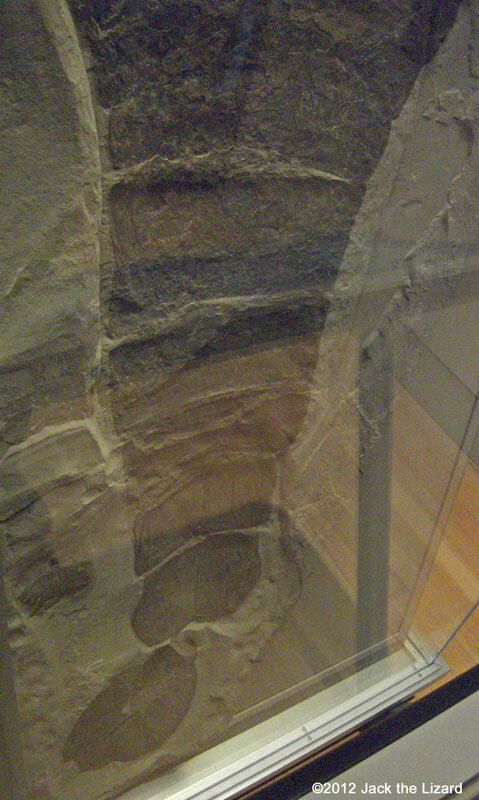 Most of the fossils of Ichthyosaurs found lying on the side, but this is flattened on the stomach side bottom. They look like dolphins or fish though Ichthyosaurs are reptiles. They had big round eyes to look for prays in water. They were ovoviviparous animal. Their embryos developed inside eggs that were retained within the mother’s body until they were ready to hatch and mother gave birth to live young. 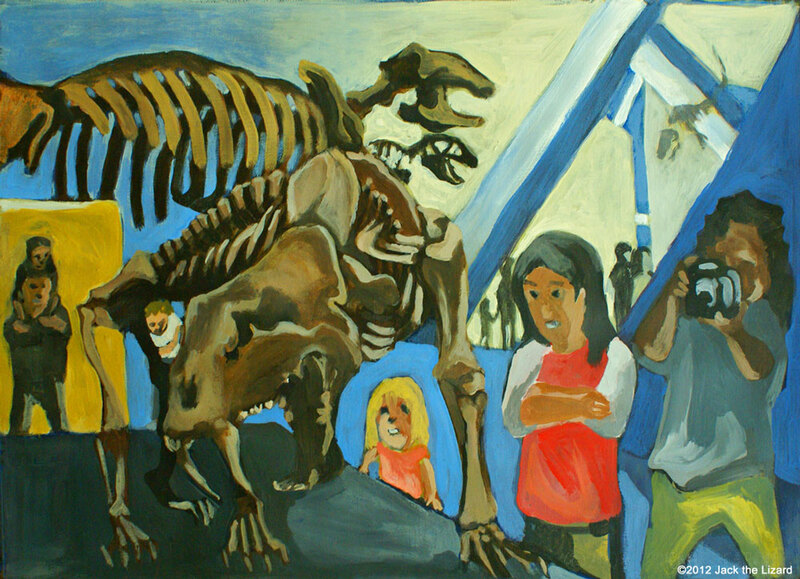 This specimen, which is about 6 metre (20 feet) long , came to the gallery in 2003 and placed to be exhibited in December 2007. Stenopterygius is the member of Ichthyosauria that probably swam in the open ocean as modern dolphins do. Stenopterygius probably ate squids and fish. The fossils were about 180 million years old, around the Early Jurassic Period and found in Germany. Excalibosaurus belongs to the group of Ichthyosauria. Sword-like snout is the distinctive feature of Excalibosaurus. The name is derived from the legend of King Arthur who had the sword called “Excalibur”. 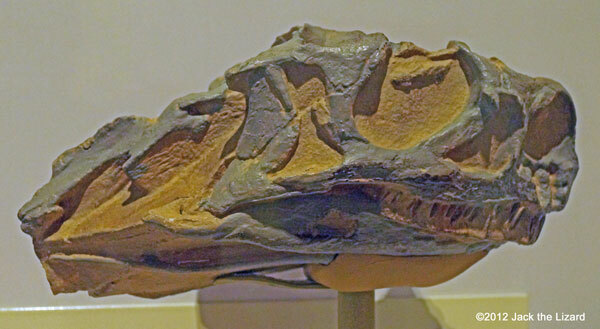 Excalibosaurus lived during the Early Jurassic Period. The fossils were 195 million years old and found in Germany. 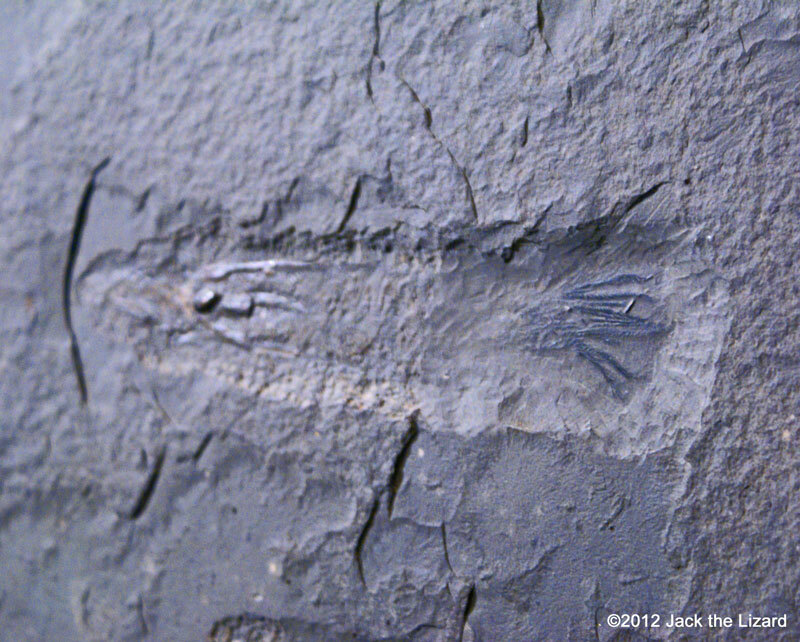 Belemnites, Chondroteuthis Sp., were relative of squids lived 180 million years ago in the seas of the Jurassic. This fossil is very rare because the soft tissue of the squid is fossilised too. Interestingly the fossilised parts of belemnite such as arm hooks or internal shell have been found from the stomachs of Ichthyosaurus. 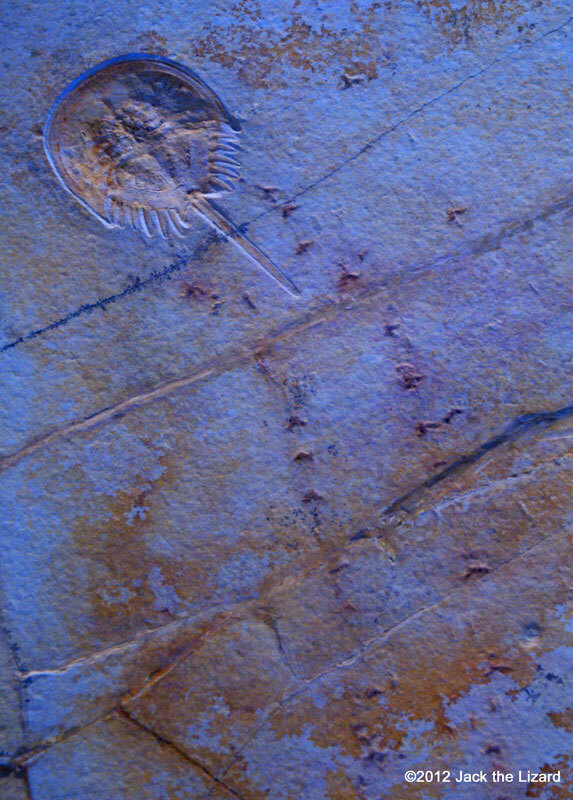 The horseshoe crab, Paleolimulus specious, was found from the 148 million year-old slab in Solnhofen, Germany. The crab and his footprints were covered with mud. This fossil is the mud side so the footprints are popped up. This is the Stegosaurus from the late Jurassic period, 150 million years ago. It walked on 4 legs slowly just like elephants today. The plates were not the tool to protect themselves from predators but the equipments to communicate with others or to mate. The left is Allosaurus, the largest predator in the same period. Fern and ginkgo thrived during the Jurassic Period. 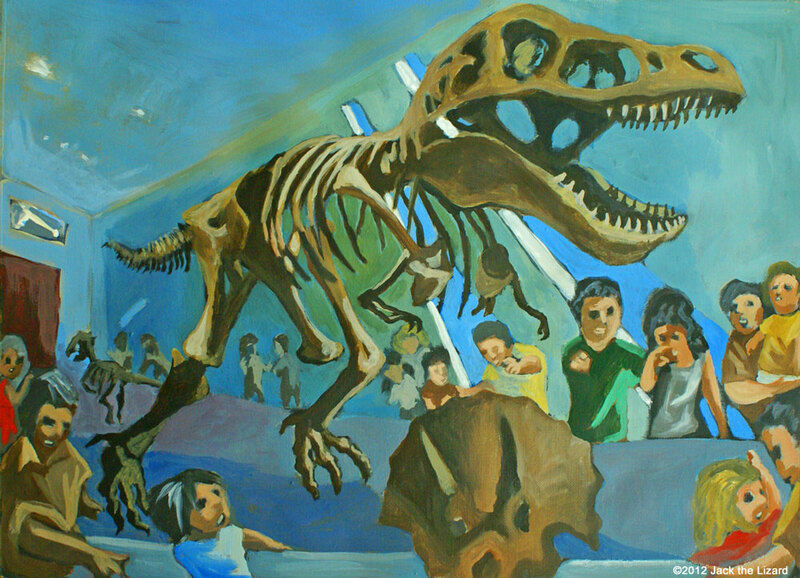 Tyrannosaurus rex appears as proceeding to the tunnel connected from the Jurassic to the Cretaceous. The gigantic body and running posture are quite spectacular. The scull of Triceratops, the first horned dinosaurs, sits on around the T.rex’s huge legs. 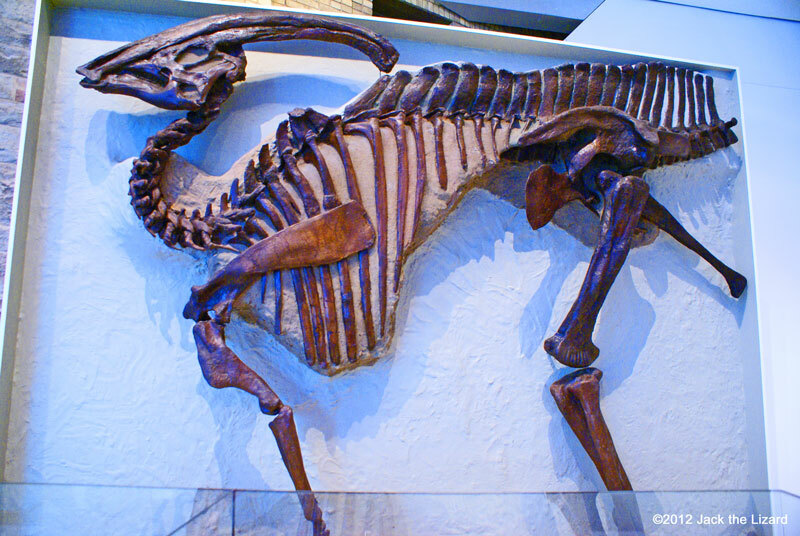 Parasaurolophus was found at Dinosaur Provincial Park in Alberta in 1920. 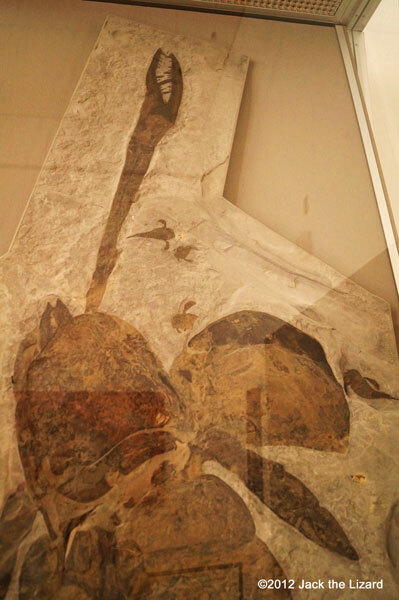 This is one of the most famous fossils of Parasaurolophus in the world. 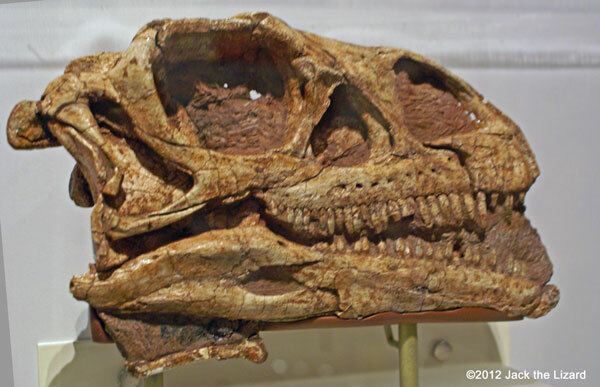 Gryposaurus, a genus of duckbilled dinosaur, was the very first dinosaur collection of 1918 by the museum. 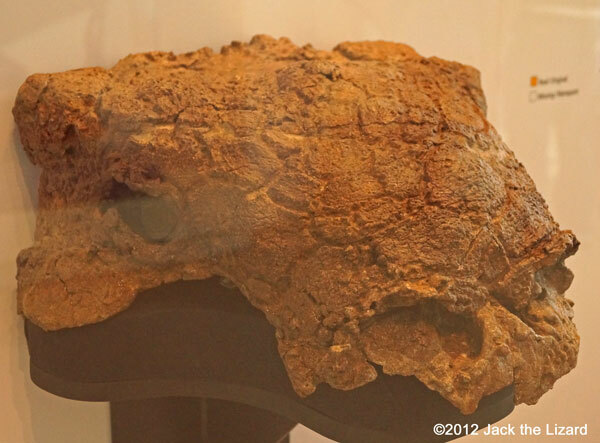 This is the unique specimen that some fragments of skin are preserved. 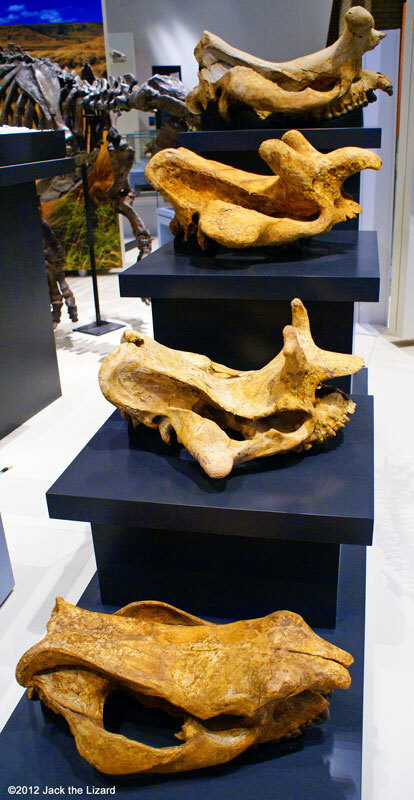 The skull (Left) and tail (Right) club of Euoplocephalus discovered at the Dinosaur Provincial Park, Alberta, Canada. The fossils are about 76 million years old. Euoplocephalus is one of the Ankylosaurian dinosaurs that lived during the Late Cretaceous Period. Albertosaurus is one of the tyrannosaurid dinosaurs that lived during the Late Cretaceous Period around 76 million years ago. Albertosaurus is not as large as tyrannosaurus rex, about 30ft (9m) long and weighed approximately 2tonnes. Although Albertosaurus is not as much powerful as T.rex, it was probably agile predator hunted down prey such as Hadrosaurus. 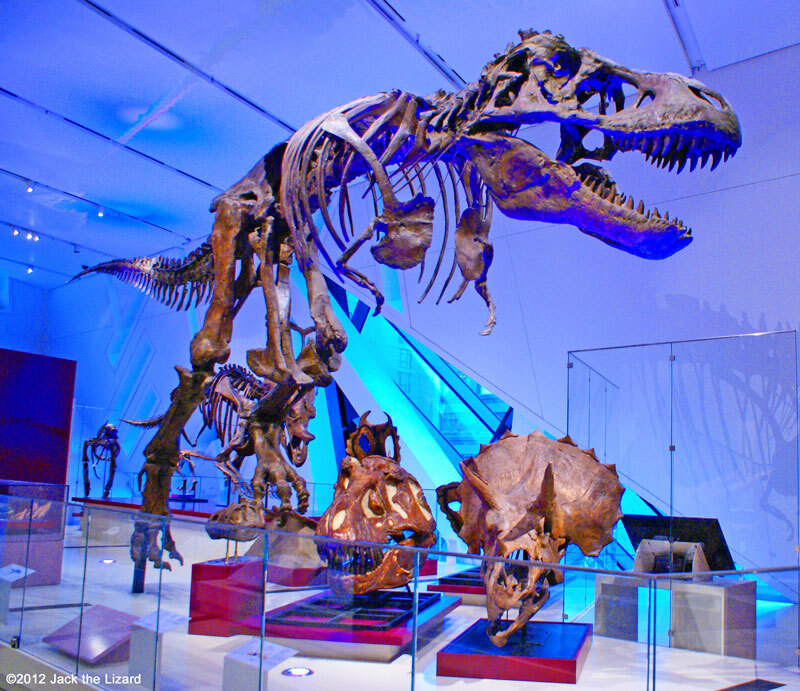 Tyrannosaurus rex had their eyes facing forward and had three dimensional visions. The short and sturdy neck supports its huge skull with powerful heavy jaws. The rex ran fast when young and smaller, but an adult was not so agile because of the size and weight of the body. The size and shape of skull change a lot during its growth. It was sometimes misidentified as different species or new species. 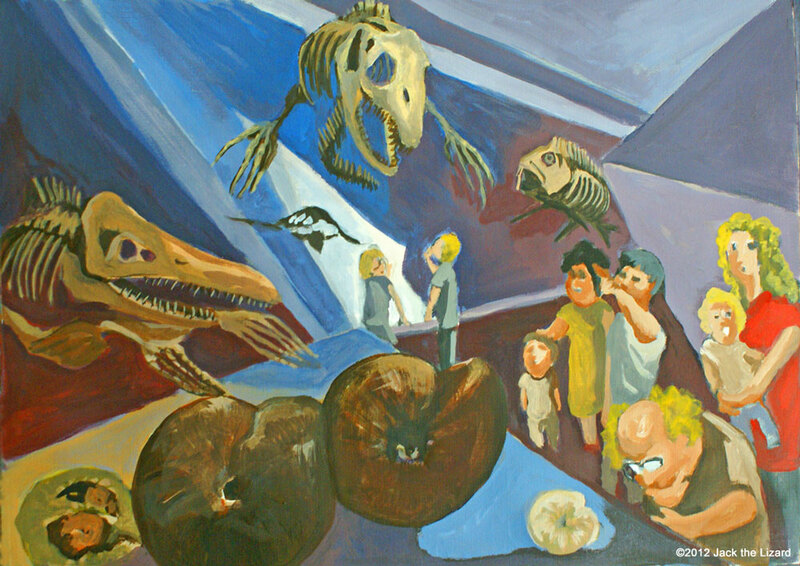 Here you are at the exhibition area of Cretaceous ocean. Predators such as Plesiosaurs, Xiphactinus and Archelon are displayed as if they are swimming. You can also see their prey such as ammonites, shrimps, and crabs. 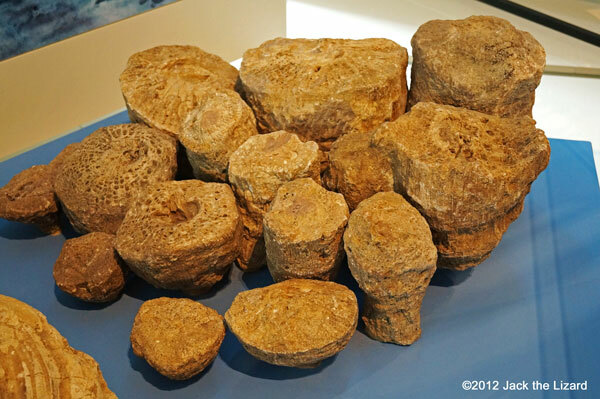 Rudist were molluscs which form reefs during the dinosaur age. The fossils of Rudist bivalves found in Jamaica, Late Cretaceous Period about 75 million years ago. Rudist bivalves found in Mexico, Late Cretaceous Period about 70 million years old. ROM holds very unique exhibition that is the fossil of dinosaur’s nest, and eggs with embryos about to hatch. 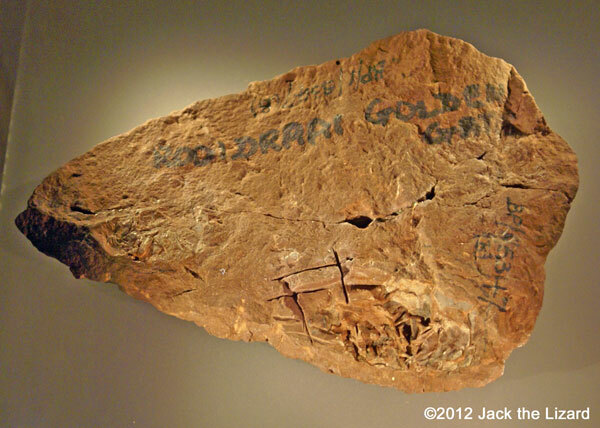 The fossil was discovered at Golden Gate national Park, South Africa in 1976. 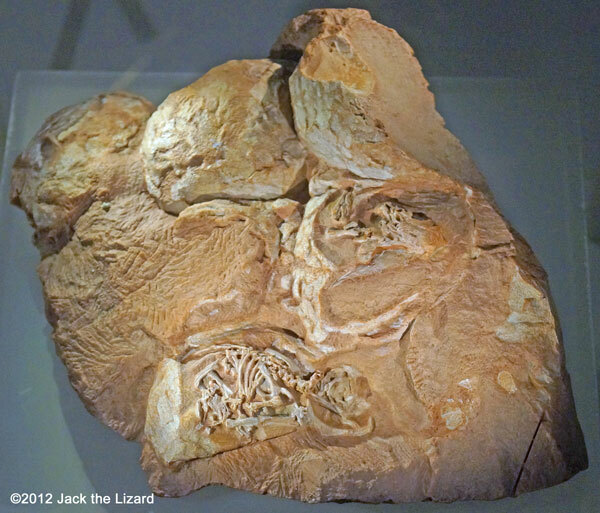 For quite sometimes it was unknown that the eggs belong to which dinosaur, and then in 2004 it was identified as Massospondylus at University of Toronto. 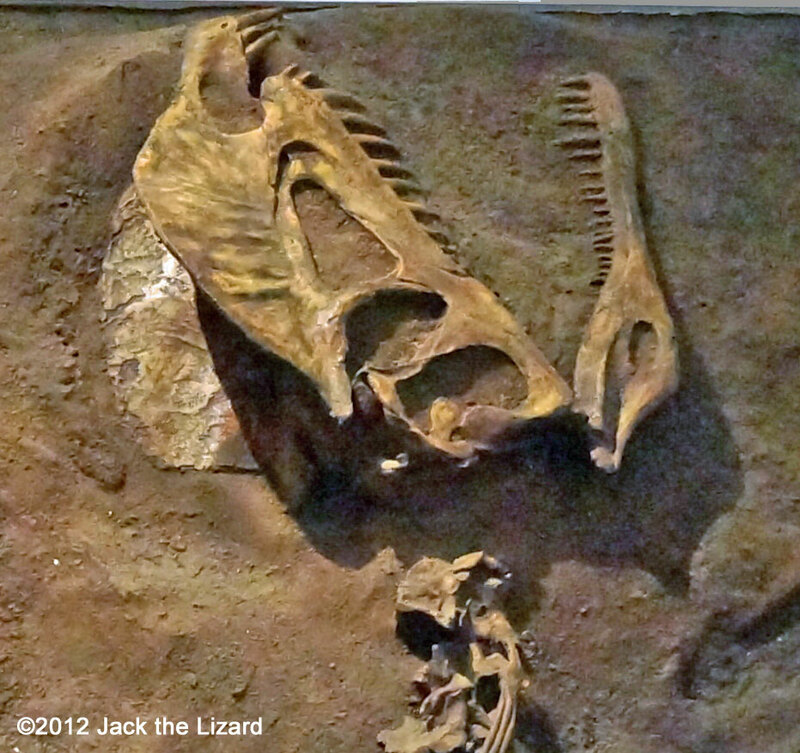 The photo on the left is the fossil of dinosaur’s nest found by the paleontologist Dr. David Evans in Golden Gate National Park in 2005. 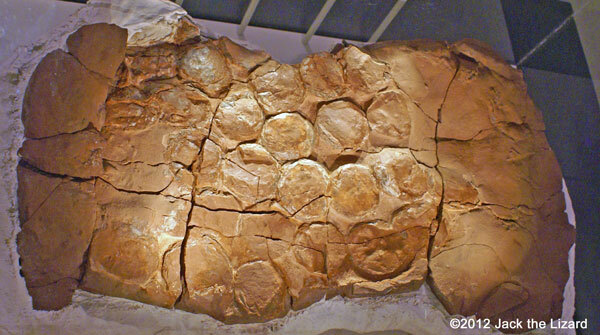 The fossil tells us curious information such as the numbers of eggs laid at one time. There are about 30 eggs tightly to each other in this nest. The egg is as large as goose egg. Did Massospondylus take care of the babies? It is not easy for paleontologists to understand prehistoric animal’s behaviour. Sometimes they get clues from the fossils conditions, positions or anatomical structures. They also compare between those of prehistoric and those of animals living today. The fossil contains embryos which are about to hatch. Any of them do not have developed teeth. Since Massospondylus are herbivorous, teeth have very important to pluck off and chew the plants. 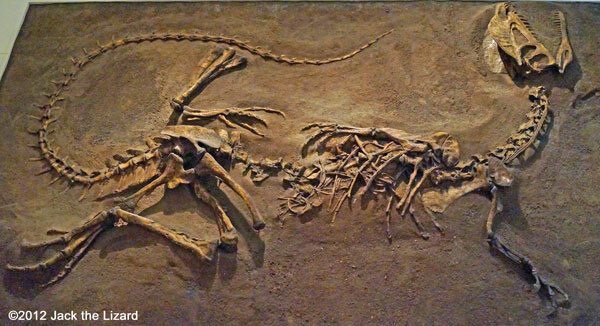 So it was possible that Massospondylus mothers delivered the plants to feed their babies. It can be studied from currently living animals which are thought closer to dinosaurs such as birds and crocodiles. Above all birds could be the direct descendants of some dinosaurs. During incubation birds stay sitting in the nests for a long time to protect their eggs from cold temperature or predators. After hatching, the parents keep flying to collect foods for their chicks. Crocodiles also protect their eggs at the nest. They sometimes carry their new born babies to safer places if it is necessary. So, the paleontologists think that some dinosaurs also did parenting in some way. What is the dinosaur Massospondylus? 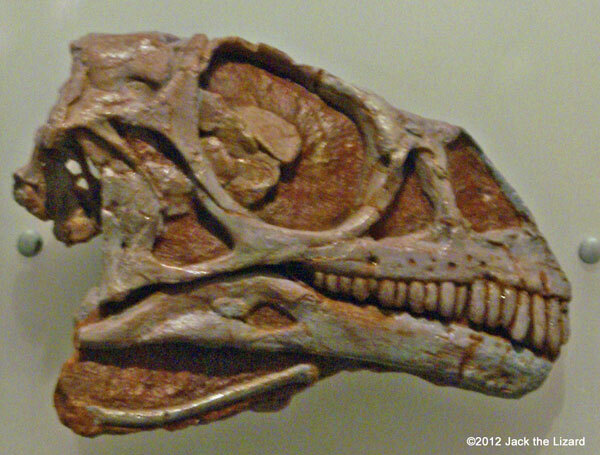 Massospondylus were on the earth at the Early Jurassic (190 million years ago). 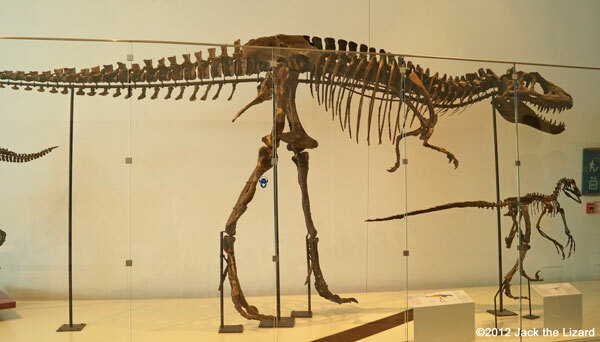 ROM does not have the whole-body specimens unfortunately, but the cast of the whole-body specimen of Plateosaurus is on display in the same gallery. Plateosaurus is very close to Massospondylus. 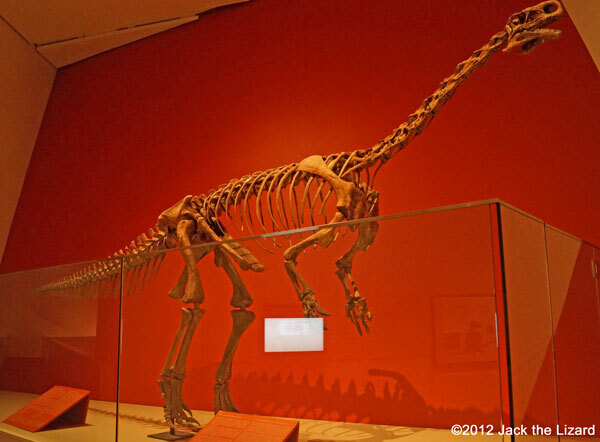 As well as Massospondylus, Plateosaurus is a Prosauropod dinosaur. The significant figure is the long neck and small head on top of it. They probably moved on four legs while young, and two legs after grown up. They were herbivorous. They plucked the plants with their indented teeth and swallow them without chewing. Prosauropods emerged in the Late Triassic and evolutionary diverted rapidly. At that time the earth had only one land, the supercontinent, called Pangaea. So the Prosauropods could spread all over Pangaea without any barrier. As the result, the Prosauropods have been found from all of the five continents including Antarctica. The Prosauropods went extinct by the mid Jurassic when Sauropods diverted and increased its population. Massospondylus shared their habitat with other animals. 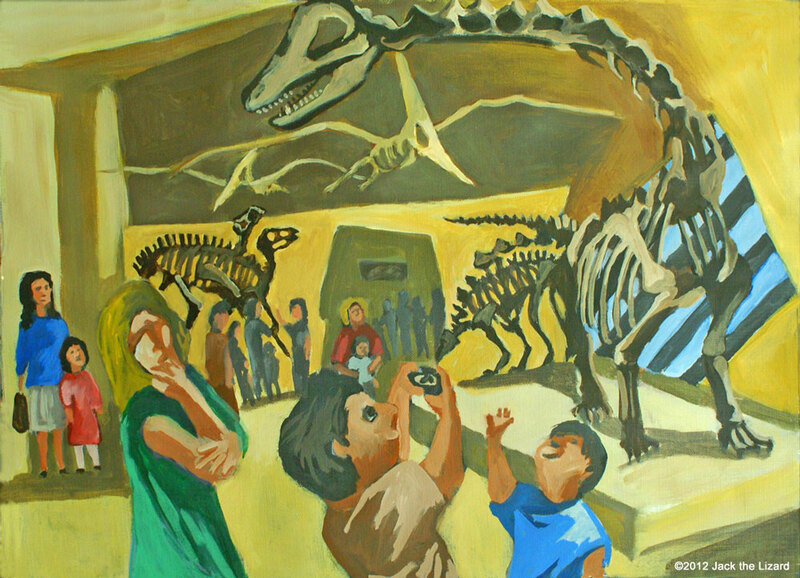 Many kinds of fossils have been found in the same stratum such as cynodonts and mammals, early crocodiles and turtles. One of the fiercest predators for Massospondylus was Dracovenator. This 20-feet long with crested dinosaur could be apex predator during the Early Jurassic Period. 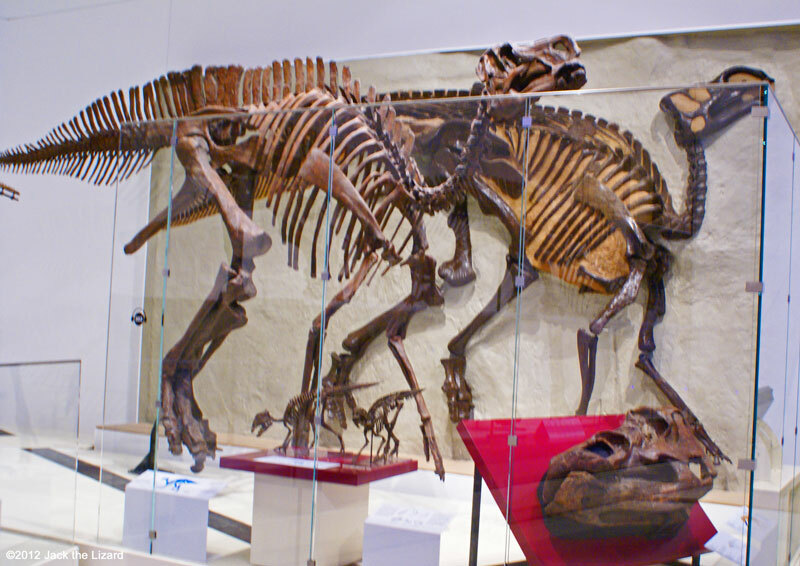 The room of the Cenozoic Era has mammals, which are as large as dinosaurs. Mammals and the other animals of 400 species including 30 extinct mammals are on display. The elephant size sloth and horses as small as current dogs are side by side. The relative of Brontops which resemble modern rhino were found in Saskatchewan. The fossils are 35 million years old. Its shoulder height is 2.5 metres, slightly smaller than elephant. The horn might be used for defence. The shape and size of the horns changed while it grew. Eremotherium lived 15 million years ago, the Pleistocene period in North America. They were tall as 5 meters (about 16 & 1/2 feet) when stand up. Eremotherium was gigantic sloth which walked around the ground and stood up to get leaves and twigs from trees. Therefore the life of this ancestor of sloth was quite different from modern sloths which spending long hours on trees. 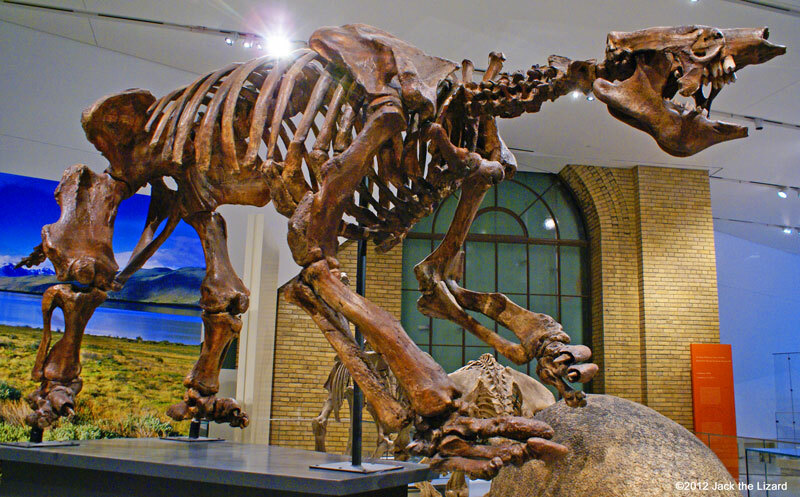 Nothrotheriops is a relative of sloth as large as bear. 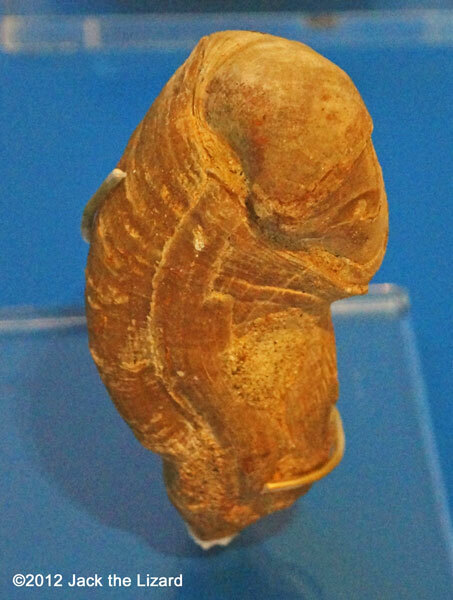 This is its coprolite. The coprolite is important because it tells what its owner ate. 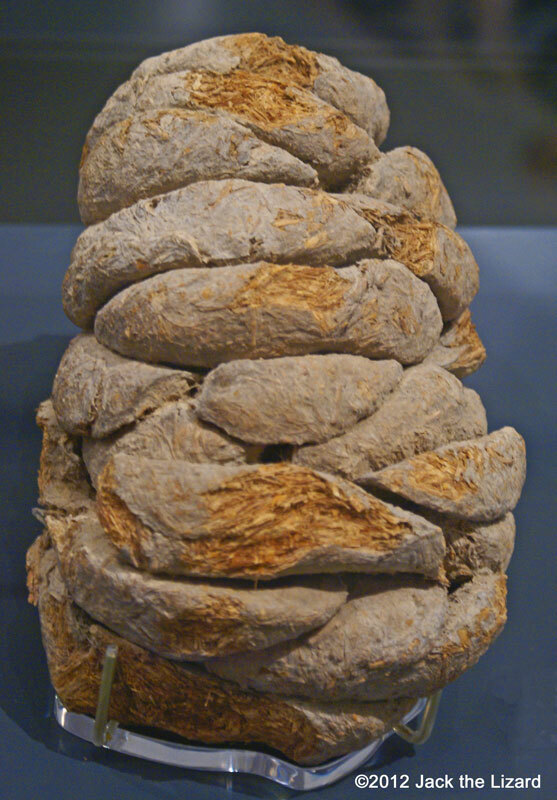 This fossilised pooh includes many fibers of plant materials in it.